NAMM 2019: 2019 sees Toontrack celebrating 20 years in business, and to celebrate, the company has a series of product launches on the horizon. The most notable of these is EZbass, the latest in the company’s EZ line of products and what the company describes as a “revolutionary bass software instrument”. Following the runaway success of EZdrummer, which is now at version 2, Toontrack also released EZkeys and EZmix, and now the company is looking to simplify your low-end life. As well as featuring a high-quality collection of bass samples, this also promises to combine MIDI and smart songwriting features to generate basslines. 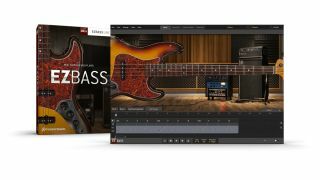 Toontrack says that EZbass will feature a wide range of presets and come with amp/cab sims and effects. It’s projected to be released in the fourth quarter of the year, but this is a tentative date at this stage. As well EZbass, Toontrack has also confirmed two new SDX expansions for Superior Drummer - Orchestral Percussion and Decades SDX - and the Pop Punk EZX for EZdrummer. These will be rolled out throughout the year. Find out more on the Toontrack website.